“Hello – may I speak to David Osborn?”, announced the voice at the other end of my cell phone line. My jaw dropped as I recognized that unforgettable voice from way out of my past – over thirty years ago, to be exact. It was none other than my very first roommate from Pasadena, California, my old friend Al. What followed in our phone conversation was a long trip down memory lane. And one of the highlights of the conversation was my thanking him profusely for his influence in guiding me more along the path of herbs for health and healing. Of all the things in my life, I reflected, herbs were probably the single most valuable thing to me, veritable life savers, the serendipitous gifts of Mother Nature that were practically there for the asking. Al used herbs on a regular basis for all his health needs, and advised me to do so as well – advice which I gladly followed. Let me repeat that key statement once again: Of all the things I have encountered throughout my life, herbs stand head and shoulders above all the rest in their great value to my overall life and health. I really don’t know where I’d be today if it weren’t for herbs. Indeed, Al was one of those key formative influences who stepped in at a critical point in my life to guide and shepherd me onto the herbal path, but he was by no means the only, nor was he the first. There had been others before him. The first one I can remember, and the very first if my memory serves me correctly, was my voice teacher in college, Professor Leighton. He was very big not only on herbs but also on nutrition for optimum health. “A singer’s body is his instrument,” he would remind us, “You must keep it clean and healthy.” And keeping the body clean, when it came to singing, meant especially keeping it clean from phlegm. And so, Fenugreek tea (Trigonella foenum-graecum) was probably the very first herb that I was introduced to, thanks to Professor Leighton. “Vitamin C and Fenugreek tea” was his motto, with the vitamin C to ward off colds, and the Fenugreek tea to act as an expectorant to loosen up the phlegm in our sinuses. Mr. Leighton kept a large box of Kleenex on the piano in his voice studio, and had us sip Fenugreek tea as we practiced our scales. Then, when we hit the high notes, their vibration would dislodge the phlegm, and we’d reach for a tissue to expectorate it. Many voice students of his, said Mr. Leighton, had throats and sinuses that seemed hopelessly blocked and congested with phlegm, but Fenugreek tea had done wonders, he affirmed. After Mr. Leighton had introduced me to Fenugreek tea, one of the first herbs I tried for the sake of my health was Dandelion root (Taraxacum officinale), which I had heard was very good for the stomach, liver and digestion – key problem areas in my health. I remember vividly that first cup of Dandelion root tea – it seemed to be so awfully bitter! But now, after forty-plus years of drinking herb teas, that Dandelion root, which once seemed so bitter, almost tastes sweet as my palette has grown accustomed to the rich and nuanced flavors of herbs. Another initially repulsive herb that I was introduced to by a friend in my early college days was Valerian root (Valeriana officinalis) – good lord, what a stink it raised! But it was indeed effective at calming my nerves and bringing on sleep. Mu Tea was another herbal formula from the Far East that was popular in the herb sections of those early health food stores, which had a large and avid following. Its rich, nuanced flavors further awakened my palette and made it more friendly and hospitable to herb teas – and it was also refreshing and energizing. My first real herbal healing miracle and eye opener to the amazing healing power of herbs and other natural medicinal substances came when I was teaching English as a second language in Japan after my college days. I had one real killer of a stomach ache one evening – so much so that I was literally doubled over in pain. My homestay mother, Mrs. Nagata, quickly reached into her home medicine cabinet and pulled out a dried bear’s gall bladder (Felum ursi), cut off a piece, pulverized it with a mortar and pestle, and forced a quarter teaspoonful of it down my clenched jaws as I was doubled over in pain, giving me a sip of water to wash it down with. My relief was complete and immediate, and the excruciating pain was gone within a minute. Now, I know that the hunting and poaching of wild animals for their medicinal parts is a controversial, hot button issue amongst those who are concerned with preserving biodiversity and the ecosystem, not to mention animal cruelty issues, but in so many cases, these animal substances have continued to be used in Chinese herbal medicine precisely because they are very potent, reliable and effective remedies. And my miraculous healing with the bear’s gall bladder that evening truly bore that out. To borrow a substance, like bile, that one is acutely lacking in from an animal is one key way that traditional medical systems utilize our close kinship with the animal kingdom. The use of Ox Bile Extract in the over-the-counter digestive aids sold in health food stores follows this same basic principle. Mrs. Nagata was a very studious type, and often had her head buried in a book – a habit that I caught from her, which aided me greatly in my study of herbs. My healing miracle with the bear’s gall bladder had awakened in me a desire to know more about some common herbs used in Oriental herbal medicine, so one evening Mrs. Nagata and I sat down and opened up one of her multi-volume encyclopedias to an article on the subject and read about them. In those early days of the health food movement, Macrobiotics was all the rage, and a popular restaurant in the center of Osaka where us English teachers would hang out was called the Fuku-en, which means, “Happy Garden”. I was told by the proprietors that the very founder of the Macrobiotic movement, Georges Ohsawa, whose real Japanese name was Nyoichi Sakurazawa, started their restaurant. The original Japanese term for the Macrobiotics dietary system he founded was Genmai Seishoku, or “the Brown Rice (literally ‘unrefined rice’) System of Correct Dietetics”. Truly, Macrobiotics was a wonderful culinary experience. In addition to the brown rice that formed the mainstay of the diet, there were also a wide variety of side dishes, consisting of various sea vegetables like Kombu, Hijiki, Nori, Wakame and Arame; Japanese pumpkin squash, called Kabocha; and my favorite, which was Goma Dofu, or Tofu made with Sesame seeds. As a garnish or condiment for our brown rice, we would use Gomashio, which is made from sea salt and roasted sesame seeds. I was all gung ho on Macrobiotics, and ate a heck of a lot of brown rice – it took a long time to boil or cook up, but at least it was easy, if not so quick, to fix. Once, when I suffered from an extreme case of low energy and devitalization, I took my first trip to visit an acupuncturist. The acupuncturist came into the room and did what seemed to be nothing more than a massage of my back while I was lying face down on my belly; I waited for what seemed to be ages, wondering when the acupuncturist would return to finally stick the needles in. When he finally returned, I asked him if he was going to put the needles in and he told me that he had already inserted them the first time he came in – and that now he had returned to take them out. Boy, was I surprised! The acupuncturist’s message to me was not to eat so much brown rice, but to eat more side dishes as well – he felt that too much brown rice was not right for my constitutional type. I asked the acupuncturist if he had any recommendations for me in terms of herbs, and he told me that that wasn’t his department, or specialty. You see, in Japan, the acupuncturists are trained to do only acupuncture and massage; to get herbs, you had to go to a pharmacy and get seen by a pharmacist who had been trained in Kampo-Yaku, or Chinese herbal medicine (literally ‘Chinese Formula Medicine’). Luckily, there was a Chinese herbal pharmacy right around the corner from the Fuku-en. The next time I was feeling out of sorts, when I had symptoms of sluggishness, bloating and slow digestion after meals, I took the opportunity to visit this herbal pharmacy for a consultation. The formula I was prescribed was Rokkunshi-to, or the Decoction of the Six Gentlemen. It was for a sluggish, devitalized spleen, pancreas and digestion that had become bogged down by an excess of phlegm and dampness. It came in a nice little bottle, and consisted of little pills or tablets that had been made from the freeze-dried extract of the original herbal decoction. I could either take my medicine in pill form, I was told, or dissolve the pills in hot water and drink them as a tea. The “King Herb”, or principal ingredient of the Six Gentlemen Decoction was none other than the legendary Ginseng (Panax ginseng), a Qi tonic and energizer for several core bodily functions, including the spleen / pancreas functions of digestion and assimilation. To this first “gentleman”, three subsequent herbal gentlemen were added to assist the king and make its energizing properties more specific and focused on the spleen, pancreas and digestion: Bai Zhu, or Byaku Jitsu in Japanese, a spleen tonic that also dried up excess dampness (Atractylodes macrocephala); Fu Ling, or Bukuryo in Japanese, a gentle diuretic to drain these excess fluids and dampness from the body (Poria cocos); and Zhi Gan Cao, or Ji Kanzo in Japanese, which is Honey Baked Licorice root – a spleen tonic that works closely with Ginseng while also balancing and mellowing out the effects of the latter. These four herbs are known as the Four Gentlemen, and serve as the core of the formula. To these initial four gentlemen are added two more “gentlemen”, which enhance the formula’s ability to dry up and concoct / eliminate accumulated phlegm and dampness. The first of these, Chen Pi, is dried, aged tangerine peel, which harmonizes the stomach function and dispels phlegm and dampness (Citrus reticulata); and the second one, Ban Xia (Pinellia officinalis) is an acrid, drying and slightly toxic herb which is a strong remover of phlegm and dampness. And finally, two more ingredients, fresh Ginger root and Chinese Jujube dates, are added to balance and round out the formula, with the fresh Ginger root also serving to detoxify the Pinellia. Looking back on it, I can see how the basic principles followed in the construction of this basic and famous Chinese herbal formula are quite congruent with the basic principles of Greek Medicine, although in theoretical terms, the pathophysiological principles behind the condition it was used to treat might be expressed a little differently. Greek Medicine would probably see this as a condition in which a decline in the vital metabolic and digestive Fire has allowed pathogenic excesses of the opposite yet complementary Water element, in the form of turbid phlegm and dampness, to accumulate in the digestive tract and the core organs of digestion. The overall nature and temperament of the herbs selected to treat this condition would be basically the same as in Chinese herbal medicine – warming and stimulating herbs like Bay Laurel leaves and Juniper berries, for example, combined with expectorant herbs to concoct and remove the excess phlegm, like our old friend, Fenugreek seeds. 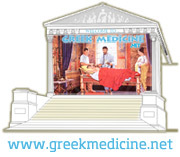 Truly, Chinese herbal medicine has its own humoral principles and concepts, just as surely as Greek Medicine does. Both traditional healing systems are dealing with the same clinical realities. There have been two reigning passions in my life that have served to guide my path throughout life: music and healing. To that I can add a third, which has been spirituality and metaphysics – which has found ample expression in the Medical Astrology section of my website. After I had studied voice with Professor Leighton in my college days, I went to graduate school in Seattle, where I studied ethnomusicology, or the study of world music, at the University of Washington. Back in those days, which was also in the seventies, Seattle was a city that was fertile soil for spiritual pursuits. I was involved in a spiritual path called Eckankar, which was also billed as The Ancient Science of Soul Travel; although the true quality and authenticity of this spiritual teaching may be open to debate, I nevertheless had some of my most profound spiritual experiences while on this path. And its founder, Paul Twitchell, had written a book entitled Herbs, the Magic Healers, which advocated herbs as a basic healing path for those “Eckists” who were his disciples. Although a lot of the material in this book seemed rather far-fetched and fanciful, there was also a lot of sound advice and herbal healing principles presented therein. It was within the Eckankar community in Seattle that I found my first herbal “guru”, whose name was Gary. He was like a living, walking encyclopedia of herbal knowledge. At that time, I was still struggling to get a basic foundation of herbal knowledge under my belt, and my herbal guru, Gary, was very helpful in that quest. This basic phase of my herbal education could be summed up as constructing a kind of basic conceptual framework via which I could categorize and group herbs according to their basic therapeutic properties and uses, and understand their healing effects. It was also involved with constructing a basic “inner herbal” inside my head of common herbs for common uses – this herb for this, that herb for that. Gary would also take me out into the wilderness and show me various herbs: This herb here is Hemlock (Conium maculatum), which was the same Poison Hemlock that Socrates drank; that herb there is none other than Stinging Nettles (Urtica dioica), which, unlike Hemlock, is a very useful and nutritious herbal superfood. Although eating the fresh leaves would sting your mouth and tongue, Gary assured me that if I took a batch home and either steamed or stir fried them, they would lose their sting. The old Eck Master and Tibetan yogi Milarepa, Gary told me, would subsist for long periods of time on nothing but Nettles. It was while attending graduate school in Seattle that I encountered my first major health crisis. To save money, I decided to go on a very cheap diet which I, in my youthful folly and inexperience, erroneously believed would be sufficient and complete. Day after day, for breakfast, lunch and dinner, I ate a peanut butter and honey sandwich made with Orowheat bread, which was washed down with a cup of instant orange Tang, which contained vitamin C, but even much more refined white sugar. After about a month or so of subsisting on this meager and unbalanced diet, I came down with a horrendous case of liver and spleen infection and enlargement, complicated by a nasty case of strep throat and a high fever, because I had let my immune system weaken and degenerate. The U of W doctor who saw me thought it was a case of mononucleosis or the “kissing disease” which was somewhat of a trendy diagnosis in those days, but other holistic health practitioners who have heard the story since then believe that it was probably some form of hepatitis. Anyway, there was definitely heavy liver involvement, and after that crisis, I lost a lot of weight, got a sallow complexion, and got a lot more frail and sickly in general. Needless to say, herbs were there to help me rebuild my health – tonics and liver herbs, mainly. Those who decide to pursue a career in holistic healing have often – or maybe even usually – had some terrible health crisis in their past that they healed naturally – whereas all too many of those who go to conventional medical school are simply interested in making a good living as a doctor. When I returned from teaching English in Japan, I first returned to stay with my parents who lived near San Diego, California. That was followed by my first job stateside, working for a Japanese limousine service in Little Tokyo, in downtown Los Angeles. I initially rented a modest apartment right downtown, within walking distance of my first job, but the blaring music of the Mexicans who lived in the neighborhood would keep me up at night. And so, I soon found a place in Pasadena, a nearby suburb, and shared an apartment with Al. It was in the black section of town, right behind a Kentucky Fried Chicken. Al, as I said, was an avid user of herbs – in teas, in pills or capsules, and even topically in the form of salves and balms. I would ask him about many of the herbs he took, and what they were for, and he would be glad to open up and teach me about them. Al would also give me lots of other valuable gems of health advice, such as eating more fresh fruits and vegetables: “They’re the protective foods, which protect your body from serious degenerative disease,” he would tell me. Soon after I moved in, Al took me with him to visit a nearby health food store and meet a friend of his, a guy by the name of John Hopkins, who was the store’s proprietor. The store’s name was “Oh Happy Days”; it started way back in 1976 or so, and it has been in operation ever since. Next time that you are in the Pasadena area, I highly recommend that you pay John and his store a visit; in recent years, he has added a vegetarian café to his store – so drop in for lunch, or dinner. John’s store was just a few blocks away from where we lived, right across the border into Altadena. I forget exactly what we went over to John’s store to get that day, but dear “Brother John” became quite a mentor to me, and was instrumental in guiding me towards holistic healing as a career path. Of all the people in my life, with the possible exception of my father, I have always looked up to John as one of the most virtuous and selfless people I know. He had endured many personal sacrifices to keep his store up and running, and always charged his customers fair and affordable prices, being generous and truthful to a fault. As a result, everyone in the community trusted and relied on John, and his store became the hub of the local holistic and Bohemian community, which were one and the same thing in Altadena. And so, I call John Hopkins “Saint John, the Health Food Gandhi of Altadena”. It was John Hopkins who kept prodding me to pursue a career in holistic healing. In this, I think that he was, to a large extent, living vicariously through me, since he had for years tried to pursue and finish a professional education in Chiropractic, but was never able to get the necessary time or money together to finish up at Chiropractic College. Nevertheless, Brother John was always studying up on herbs and nutrition, and doing his best to keep abreast of all the latest advances in the fields of nutrition and herbal medicine. And so, there were, and still are, many who come to John’s store who would faithfully go to him whenever they got sick, being their trusted “go to guy” for that purpose, going to him before any MD – and they still do. And if John felt that the customer needed professional help beyond that which he was equipped to give, he would not hesitate to refer him to a qualified practitioner. Truly, the level of trust and respect that John commanded from his customers was something that no professional diploma or training could buy – it was something that was inherent in his personal character. It was John’s influence and guidance that led me to embark on the next stage of my healing journey, which was to take up Oriental Medicine and herbal healing as a career path. This was written by whiteman. Posted on at 8:32 am. Filed under Herbs. Bookmark the permalink. Follow comments here with the RSS feed. Post a comment or leave a trackback.